BuddyPress Trac Feed is Available on Twitter. 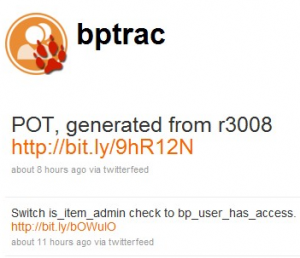 Follow @bptrac for Updates! Want to stay current with the trac feed for BuddyPress? Follow on Twitter: @bptrac. It links to http://trac.buddypress.org/log/ and it makes it easy to keep up with BuddyPress development.